Graphic Design student Ashley Webelhuth created a "welcome" illustration representing Webster's global campuses. 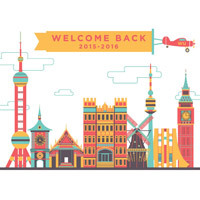 The 2015-16 academic year is here, with faculty returning and new students coming to Webster campuses around the world for the first time. New students range from graduate students advancing their careers to undergraduate freshmen preparing to live on campus. See a sampling of photos and videos from the many New Student Orientation activities happening around the globe, and look for more next week as orientation continues through the weekend. Orientation Leaders welcome new students in St. Louis. At Home in Vienna: 73 new undergraduate students and their parents learned about academic and student support services as they got to know Webster's Vienna campus this week. See and share photos in this Facebook album. Hashtag #15 in Geneva: See students at Webster Geneva form a "#15" on the lawn in this video on YouTube. Check out more photos from their orientation activities in this Facebook album. Barbecue Time in the Netherlands: Webster Leiden's orientation activities included 83 new undergraduate, graduate and study abroad students, highlighted by a barbecue, art and music. See the album of photos on Facebook. International Student Welcome in St. Louis: The "international" in Webster's student body doesn't just stem from the multicultural campuses in Europe, Asia and Africa. It also comes from the many international students who come to the original campus in St. Louis to call Webster home. The Multicultural Center and International Student Affairs hosted a week of orientation activities specifically for new students coming to Webster from abroad. Check out photos of their events in this Facebook album. Move-in, Level Up in St. Louis: While faculty and staff attended Fall Convocation to "level up," this past week was full orientation and move-in activities at the home campus in St. Louis, where Webster was founded in 1915. Staff, faculty and returning students welcomed hundreds of new and transfer undergraduates and graduate students to Webster. Follow @websteru on Twitter for photos, check out the @mywebsteru Instagram for a look from the eyes of a student, and spread the word! Check back for more orientation highlights next week as a new class of Webster students prepare to be transformed for global citizenship and individual excellence!